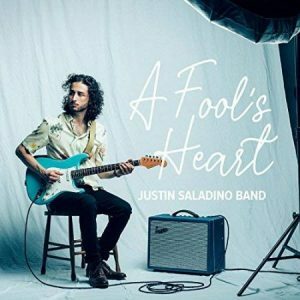 Justin Saladino’s A Fool’s Heart is a pleasant R&B influenced, John Mayer soft-rock informed, guitar based ride. Montreal’s native 23 year-old son is a guitar wizard and feel-good chill-vibes phenom. With a smooth voice, boyish good looks and guitar chops to spare, Saladino is an adult-contemporary monster. But warning fair Blues Blast reader, this is not strictly speaking Blues. There are a few classic soul styled ballads and a bit of Blues Rock guitar wailing, but mostly this is a record of soft-funk with neo-yacht rock hooks. Credited to the Justin Saladino Band, A Fool’s Heart is a great sounding well performed record. A.J. Aboud on drums/percussion and Gabriel Forget on bass create a super tight foundation for Saladino and guitarist Felix Blackburn to work on. Cleanly produced guitars with layers of overdubs, make the music stand out. Saladino and Blackburn work in perfect sync making it indistinguishable who is playing which parts. Beatrice Keeler adds vocals, David Osei-Afrifa keys, Remi Cormier trumpet and flugelhorn and Connor Seidel additional percussion. A Fool’s Heart is a focused album of all original material. The basic songwriting thesis appears to be: take 70’s R&B and Funk riffs, affix a feel good “Your Body is A Wonderland” style chorus to it and record it with modern production. Record openers “A Fool I’ll Stay” and “Honey” lay out the basic framework clearly. “Fool” is a swaying riffy meditation on loving in spite of yourself. The verses of “Honey” could be an Earth, Wind and Fire outtake before it takes a modern feel-good chorus turn. There are a number of ballads and the basic old/new mashup holds. Stand out track “Put the Hammer Down” is a horn flecked acoustic Jack Johnson meets Lynyrd Skynyrd ode to denial and projecting. Outlier “Third Week of June” is more of a Laurel Canyon does Country song with a 2 step feel and rootsy yearning lyrics, again with a modern sounding chorus. This record is full of reflections on life and love. The lyrics at times dangerously border on self-help platitudes. This seems to be the trend in a lot of modern music, e.g. Modern Country. 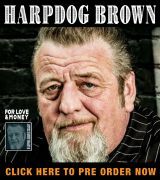 That kind of plain spoken overly straightforward, and utterly guileless, type of songwriting has also been invading Blues. Similarly the music lacks a certain bite and danger. Even when Saladino gets his distorted guitar wail on, there is a polish and controlled restraint (not the good kind of tense Buddy Guy holding back a tsunami restraint) to his playing that stops the music just short of pushing through to a more emotional place. 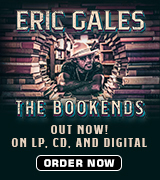 For your humble reviewer, lyrical cleverness and a bit of tightrope walking tension and/or menace are essential elements for music to be thought of as Blues. The only song on this record that fits the bill is “Bad Habit.” A deep pocketed Funk jam, this song never relents to the adult-contempo turns of its brethren. Co-written with Jessica Spilak, this song is a simple lament to bad habits. In full James Brown mode, Saladino sings with syncopated urgency. The music is less produced and has a live feel. Justin Saladino is a talented musician with a number of strengths. “Bad Habits” shows that he can get down when he wants to. A hope from this appreciative listener is that he can develop his pop sensibility into something deeper and more emotional while letting more of his bad habits shake out into his art.